Coiled welding leads and hoses can be found everywhere during maintenance turnaround services in industrial, petrochemical and power industries. However, this can pose a serious trip hazard and could be a violation of OSHA Housekeeping requirements if these leads and hoses are not organized and stored properly. Before moving your welding crew to the next plant site for turnaround services, be sure to include basic housekeeping in your safety plan. Keeping your welding lead organized and away from walkways and work areas may not seem like a big deal but being organized improves work efficiency as well as safety. 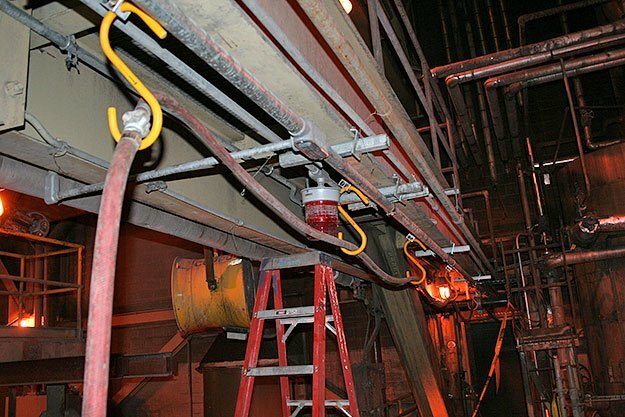 Our heavy duty giant S hooks for hanging welding leads is an inexpensive way to prevent a costly trip and fall injury. Not only do our large S hooks prevent accidents by clearing your walkways but they also contribute to the efficiency of your worksite. Your crew can quickly place Spanwell’s industrial S Hooks over pipes and beams to store welding lead where it belongs — up and out of the way temporarily or permanently. The use of giant S Hooks for hanging welding lead is basic housekeeping at its best. Spanwell’s extra-large S hooks come in 9″, 12″ and 14″ sizes for hanging welding leads, air hoses, electrical cords and more. You can buy them directly from our online store individually or in boxes of 25 (best prices).